How can you increase bookings and make more sales from your travel website? How can you guarantee a steady growth of your travel business? The answer is through travel SEO. Travel SEO is not a theoretical concept, but it’s a term used to describe the set of steps you can follow to optimize your travel website for search engines. Why is travel SEO important? If you have a travel website or blog and you are new to SEO and Digital Marketing, the first thing you need to understand is why SEO is important for your website’s success and what are the benefits of SEO for your business. Let us first start with a very quick introduction to SEO and in more particular about the purpose of SEO. Why should someone in the travel business care about SEO? The purpose of SEO is to help a website appear higher in the search engine result pages (SERPS) for keywords related to your business. For example, when a user opens Google and types “rent a villa in Sicily”, the websites optimized for SEO, appear first in the results (after the paid ads – more details below) and this means more qualified leads for those websites. 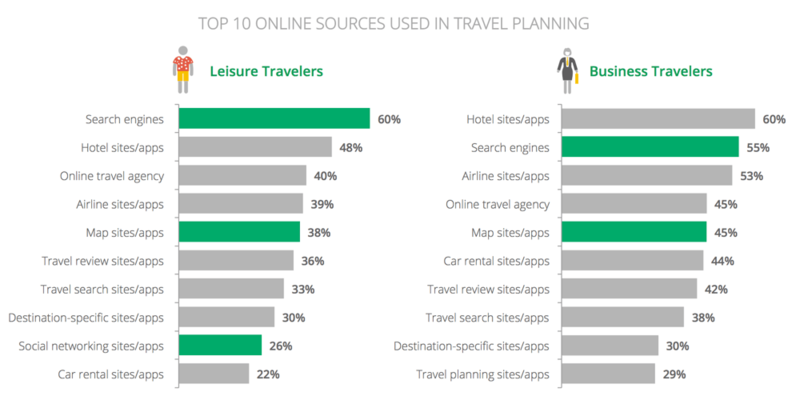 A research study by Google on the behavior of ‘travelers’ showed that a large percentage of people start their travel and booking process through search engines. So it’s obvious that if your website does not have high rankings for your business keywords, you are already losing a large percentage of your potential customers to competitors. 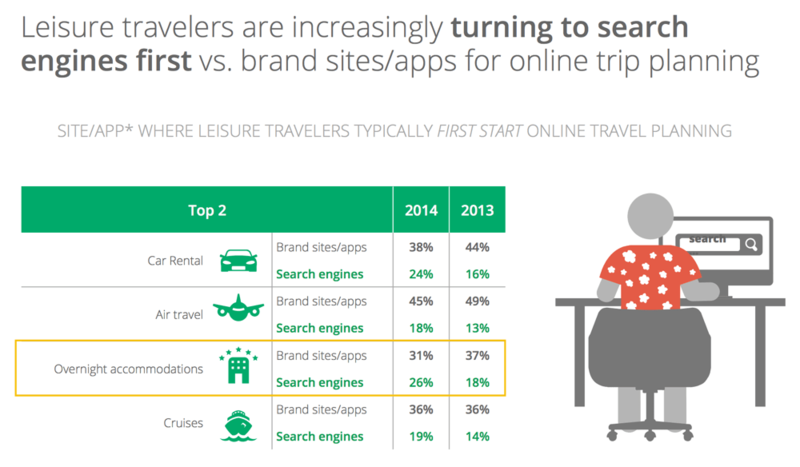 What is more interesting is that despite that fact that there are big brand websites like booking.com, airbnb.com, tripadvisor.com (to name a few), user’s still turn to search engines when they are ready to start their trip planning process. Travel websites that don’t practice SEO, will not appear in the top results organically but they can still get traffic from those searches through PPC and in particular Google AdWords. While this is a perfectly good practice and AdWords one of the best ways to get highly targeted traffic to your website fast, in the long term is not as cost effective compared to SEO. The reason is simple: when you stop advertising with AdWords, traffic will decrease while with SEO once you achieve good rankings targeted traffic will flow-in 24/7. In addition, for every visit you get from AdWords, you will have to pay a few dollars per click and depending on your daily budget, it can minimize your traffic and lower your conversion rates. SEO is not less expensive, there are costs involved but in the long term is a better investment. Can you imagine how many bookings / leads you could get if you had 2000 people visiting your travel blog or website every single day? How could this change your business plans? I’ve been working in the travel industry for a few years now and know from experience that a constant flow of targeted traffic can really transform a business and generate opportunities for growth that otherwise could not be possible. Although we always say that nothing is guarantee in SEO and Digital Marketing, achieving good rankings in a correct way can make a huge difference for travel businesses. 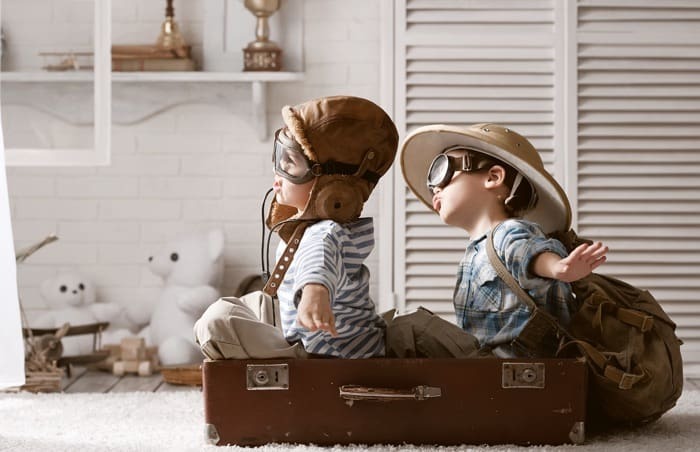 Now that everybody understands the importance of travel SEO, let’s see in more details ways to optimize your travel website for search engines. First in the list is local SEO. Local SEO is a way to optimize your website so that is shows up when people search for your location or when searching through mobile when located in an area close to your physical business address. If you examine several travel related searches in Google, you will see a pattern like the screenshot above i.e. 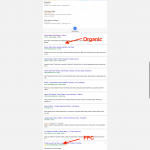 Google shows: 5 PPC Ads on top, Local SEO (Google Map) results, organic results and then more PPC ads below. Create a Google My Business account and verify your business address. Complete your Google My Business profile with accurate descriptions, contact information, photos and any other information required for your business. Add schema information to your homepage. Add your local address to your homepage. Properly optimize your page titles, h1 tags and descriptions to reference your location. Get good quality links from local websites and other highly trusted sites. Make sure that your business name, address and phone number is the same across all channels (google maps, your website, local directories, social media pages etc.). The above list is not complete but it’s enough to get you started. Note: General SEO practices (like the ones I will describe below), do have an influence on Local SEO as well. The homepage is an important page for all types of websites but in the case of travel websites, it’s even more important. In terms of SEO, the homepage should give several signals to Google about the nature of the business and the areas of operation (location of properties). Besides the title and description, you definitely need to make sure that you have schema information on your page together with your address and other contact details (as explained in local SEO above). To visualize the structure of your travel website, it should look like the diagram below. 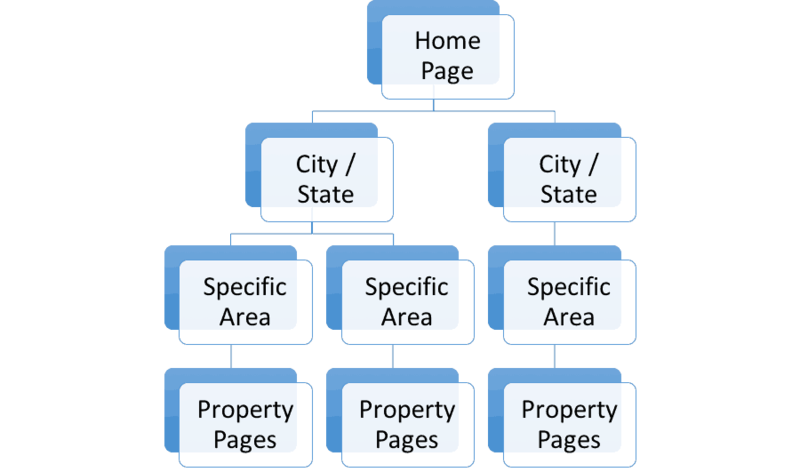 If you are using WordPress, then most probably your ‘City / State’ and ‘Specific Area’ pages will be categories (archive pages). Regardless of the platform, you need to make sure that these ‘destination pages’ are SEO optimized. This means that they should have unique titles, unique content, proper H1 tags, included in the sitemap submitted to Google and also showcase the properties available for the particular area. Read my previous post: How to SEO your WordPress categories and tag pages for more examples and step by step instructions. Next in the list are property pages. The purpose of a property page is to give potential customers more information about the particular property and convince them to convert (by either submitting a contact form or completing a booking online). Note: Read more details about breadcrumbs and SEO in my Advanced SEO Features article. This is a bit tricky especially when you have a number of similar properties on your website. When crafting the title of a property page think about the characteristics that make the particular property unique and different from the rest. The content of the page has to be unique. One of the most common problems with travel websites is content duplication and this is mainly because a property may be listed to more than one websites. Property owners list their properties in different websites to increase their chances to make bookings and they usually do this using the exact same content. This may not be a huge issue for big websites like airbnb, tripadvisor or booking.com but for smaller websites this is a problem. For SEO purposes and for a better user experience, you need to differentiate your content as much as possible. A good way is to try and describe the property features like a story instead of just stating the facts (that are already published on other websites). It is normal to use TABS in your pages to organize them better but you should know that Google will probably ignore that content or give it less value. If the content in a tab is dynamically generated i.e. users have to click on the tab to trigger the generation of the content, then this is completely ignored. For a more optimized page, try not to have important content in the tabs. You can still use them but keep your most valuable content visible all the time for Google and users. One of the factors that influence conversions (bookings) in the travel industry is user reviews and ratings. For the owner of a travel website or blog this means 3 things. 1st – That you need to show reviews and ratings for your properties. How you can get those reviews is a different story (to be covered in details in a new post so make sure you subscribe to my newsletter), but good reviews do make a difference. 2nd – You need to add schema information to your reviews and ratings so that Google may show them in the search results. 3rd – You need to have the reviews and ratings visible in the page and not in a TAB. Besides the above factors, you should have in mind that technical SEO practices are always important. For example, things like: page speed, mobile friendliness, correct use of canonical URLS, the 404 page, correct implementation of multi-language websites, paging, optimization of images and videos, sitemaps, correct configuration of Google Webmaster tools and many more are necessary for a fully optimized travel website. Note: Read my SEO tips article and how to perform an SEO Audit of your website for a complete list of all factors you need to take into account when evaluating technical SEO. It is widely accepted in the SEO industry that although social signals do not directly impact rankings, they can help in a number of indirect ways. People may visit your Facebook page before making a booking with your company to read reviews and get an idea of the experience of your existing customers and you don’t want them to visit a page that is empty or a page that was updated two years ago. Create business pages on all major networks (Facebook, Pinterest, Instagram, Twitter) and make sure that your social media profiles are SEO optimized. Build a decent fan page for your Facebook business page. Post regularly on your social media pages. The posts should not always come from your website but post content related to travel tips, things to do in your destinations, interesting things to know about your destinations and content that is not too promotional but something that readers may find interesting to read and share. Monitor mentions of your brand in all networks and make sure that you reply to any comments, good or bad. Monitor mentions of your destinations and try to engage in discussions or answer related questions without being too pushy or over promotional. Allocate a monthly budget to use for Facebook promoted ads (either promoting your properties or blog posts). Check that a page shared from your website shows correctly on social media (good photo, title and description). There is no way to avoid discussing about link building when talking about the promotion of a website in a highly competitive industry like travel. Off-page SEO is still one of the most influential ranking factors and good quality incoming links are necessary to achieve high rankings. How can you get links that matter for your travel website? Link building is always difficult and time consuming and you should be careful not to go the easy way and get links from low quality websites (even if they are somehow related to travel), because you risk in damaging your domain’s reputation in the eyes of Google and this is not good for your business in the long term. Press releases – Travel is one of the few niches that press releases are useful. Reporters and travel journalists are looking into press releases to find destinations and deals to propose to their readers and many times if you have good offers you may see your website and properties listed in big travel portals and besides the free publicity, this is also good for SEO. Mentions (links) from travel review websites and portals – Besides press releases, you can also make connections on twitter or Facebook with travel bloggers or journalists and give them incentives to visit your website. By making connections, I don’t mean sending them a message asking for a link to your website but trying to establish a conversation with them and maybe inviting them to visit your properties or sending them an exclusive offer for their readers etc. As I said above, it’s time consuming and you need to think outside the box to make this work but when it does the benefits are valuable for SEO. Although internal linking is part of on-page SEO, I included it under link building to emphasize it more because from experience this is something that most travel websites and blogs get it wrong. Internal links can help your website in a number of ways. Google uses internal links to discover more pages from your website and understand them better and users can click on an internal link to find out more about a topic or visit another page from your website. When adding internal links don’t be afraid to use keywords as the link anchor text. Unlike external links, Google will not penalize your website for using keywords in the anchor text, on the contrary it is something they encourage you to do since it helps them understand what the linking page is about. I have mentioned many times above that travel is a visual topic. People like to see photographs of properties and destinations to help them get inspiration to decide where to go for holidays. Besides the visual aspect, travel is also an experience and the best way to share experiences and build expectations on the experience your travel company can offer to potential travelers, is through blogging and content marketing. Let’s assume that you did steps 1-7 correctly and everything on your travel website is optimized. Your rankings and traffic increased but you reach a point that you want more traffic and better rankings. What should you do? The answer is content marketing. Blogging can give you good material to keep your social media pages fresh. It’s a great way to build internal links to your property pages. 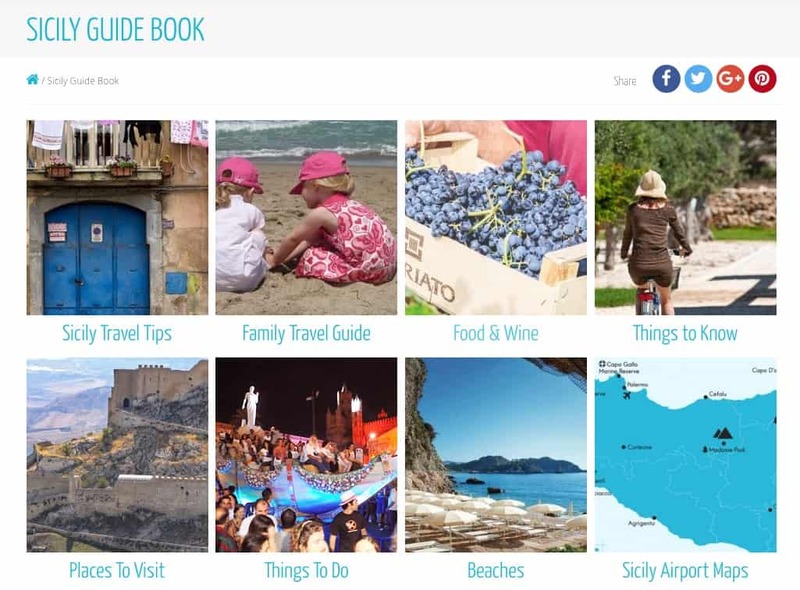 It’s a great way to educate your users and give them practical travel information and tips. It’s a great way to convince users to visit your target destinations by posting videos, images and guides on what to do once they visit, things to see, things to try etc. It’s a great way to give Google bots incentives to re-visit and index your new pages on a regular basis. It’s a great way to attract quality links from other bloggers / websites. It shows to potential customers that you are not only interested in making bookings but you also care about their travel experience and you are doing everything possible to make it better. It’s a great way to make money by promoting other’s people services on a commission. What can you post in your travel blog? Activities you can do in your destination. Places to visit while enjoying your holidays in a particular area. Special guides for families with kids. Special guides for large groups and young people. Local guides (where to eat, where to go at night etc.). Using a platform that is not SEO friendly – This is the number one mistake I have seen many times the last couple of years. Most of the available booking platforms offer a number of nice features for travel agents but when it comes to SEO they are terrible. When choosing a platform for your travel business don’t only look for the features they offer for bookings but also look for a platform that is also SEO friendly. At the end of the day you want a website that can generate lots of bookings through SEO and not a website that has a perfect backend system but no chances of achieving good rankings for your business keywords. Duplicate content issues – Anything you publish on your dedicated property pages has to be unique for your website. Using content that is already published on other websites is a bad practice and also syndicating your content on other bigger websites (without taking the necessary protective measures – think canonical URLS), is also not a good practice. No Social Media Presence – Social media marketing may not generate bookings directly but it’s necessary for establishing a good name for your brand. Not connecting with customers – Ignoring customer comments or not responding to social media messages is bad for your reputation in the long term. Hi! Thank you for your great & Comprehensive guide. I’m learning a lot since i am strugling how to SEO my website. This helps me a lot. Thank you! Thanks a lot. Good luck with your SEO efforts. Worth Reading Post, Great content and Details. Learning a lot from this Post, Thank You !!! this is exactly what I was looking for since I am doing everything by myself on a WordPress platform ,thank you for the tips .i actually found the SEO widgets on words press are very useful as well. Great post really helpful for travel websites.